Welcome to another installment of If My Book, the Monkeybicycle feature in which authors shed light on their recently released books by comparing them to weird things. 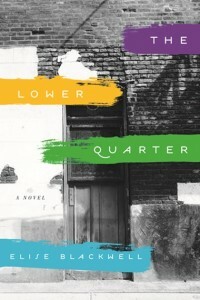 This week Elise Blackwell writes about The Lower Quarter, her latest novel just published by Unbridled Books. If my new novel were a martial art, it would be capoeira—in subject matter but I hope also in form. The Lower Quarter is about power relations—some voluntary and others enforced, some sexual and others economic—as they play out in a particular moment in a particular place undergoing transformation due to a messy combination of indigenous and external forces. New Orleans is an often steamy city that was forged in part by slavery, migration waves, and tourism; capoeira developed in Brazil under similar conditions. Not every character in The Lower Quarter is who s/he seems to be, and namelessness and pseudonyms were common to certain periods of capoeira when secrecy was a necessity. The Lower Quarter deploys the tropes of classic noir, and in the past capoeira was often associated with criminality—sometimes because the art form was itself prohibited as a form of resistance that threatened power structures and sometimes because its practitioners used their art in the service of more profitable, seedier pursuits. Is The Lower Quarter a noir or something else? Capoeira is nimble and low to the ground. It changes speeds but always follows a rhythm. Like the characters of The Lower Quarter, capoeiristas exchange attacks and defensive moves, use feints, try to pull each other off balance without direct contact, yet these movements always carry the possibility of a direct strike to the head or heart. They practice an art that believes in “the wisdom of the body,” and my novel explores what it means to be corporeal—to live in a body that can be incarcerated or move freely, that can be scarred or decorated, that can be injured or given pleasure. Capoeira can be seen as a confrontational dance of opposing forces. In The Lower Quarter, our human impulses toward self-destruction and self-preservation face off, sometimes holding each in suspension and sometimes resulting in a victory of one over the other. Elise Blackwell is the author of four previous novels: Hunger, The Unnatural History of Cypress Parish, Grub, and An Unfinished Score. Her short stories and essays have been widely published, and her work has been named to various best-of-the-year lists, translated into several languages, and adapted for the stage as well as a song by The Decemberists. She teaches at the University of South Carolina, where she is also organizer and host of The Open Book. Find out more at Eliseblackwell.com or follow her on Twitter at @eliseblackwell.